In 2011 writer Grant Morrison reinvented Superman for a new era as part of DC Comics' 'New 52' relaunch. This version of Superman wore a t-shirt and jeans and dangled corrupt businessmen from buildings. He was strikingly different from the version of Superman that preceded him; an older, married man, who used his great power a lot more cautiously. This week, in Action Comics #976 both versions have been 'merged' to create a new Superman, and Morrison's young, two-fisted, champion of the oppressed is no more. This new direction has been met with a lot of positive reviews and seems to be selling well. Nevertheless, is it possible that we've lost the perfect Superman for our times? Superman was born in the 1930s, the era of the Great Depression, Al Capone, and the rise of the Far Right. His creators were Jerry Siegel and Joe Shuster. They were both the sons of Jewish immigrants, in fact Shuster's mother had left Russia after pogroms. Neither could afford college and so Siegel earned four dollars a week in a printing plant while Shuster sold ice cream and delivered groceries. In between they tried to sell their Superman comic strip to newspapers. When Superman finally debuted in Action Comics #1 (1938) their brand new hero was depicted saving a man from being wrongfully executed, beating up a wife beater, and dangling a corrupt lobbyist off a building. In the subsequent issue Superman intervenes in a foreign war between two nations who had forgotten why they were fighting in the first place. It's difficult not to see these early stories as a form of catharsis for two young men who possibly felt helpless before the injustices of the world. In those first two issues, miscarriages of justice are overturned at the last minute, wars are ended, and bullies are punched in the face. Times changed, and Superman changed with them. During the space race Superman's power expanded and he explored other planets, while in the era of Vietnam and Watergate he questioned how he chose to use his mighty power. In 2011, the 'New 52' arrived, and Superman changed once again. Grant Morrison, along with artist Rags Morales took the Man of Steel back to his roots. Within the first few pages of the first issue of a relaunched Action Comics, Superman dangles a corrupt businessman from a building and runs from police bullets. Over subsequent issues we see him helping ordinary people to rebuild their homes and telling a jaded, cynical police officer to "be the cop you wanted to be when you were a kid." Later in Morrison's run more cosmic foes begin to surface, such as the alien Collector, the hyper evolved Adam Blake, and the fifth dimensional Vyndktvx. But even these are dispatched like the old-fashioned bullies they really are, with a smile and a strong right-hook. The very last page of Morrison's final issue, Action Comics #18, depicts a bruised Superman having just defeated his multi-dimensional foe, sitting in a crater and saying "Yeah, but you should see the other guy." Morrison's angry, proactive, working class Superman seems to reflect the age in which he was born as much as Siegel & Shuster's Superman did in the '30s. 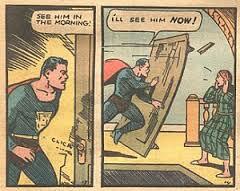 The world currently has many disturbing parallels with the world that birthed Superman in the 1930s. There has been much economic hardship, and the Far Right is once again on the rise in America and Europe. We're living in an age of conflict and many people feel unable to trust their own media. The UK has been torn by it's decision to leave the European Union, and the President of the United States is quite frankly a despicable human being who has surrounded himself with corrupt businessmen, near-Nazis, and actual Nazis. 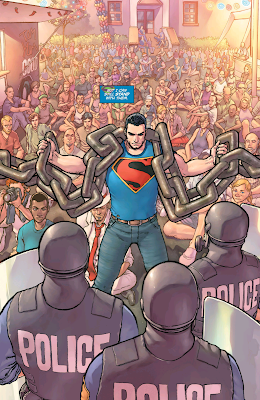 The cathartic right-hook of the New 52 Superman seems tailor made for our times. New 52 Superman however, lasted only five years before being killed off, replaced, and then 'merged' into a new version. Why then, did this occur? Consistency was one of the main reasons, or rather a lack of consistency. Writers other than Morrison struggled to hit the the right note with this version of the character. In his otherwise entertaining Justice League: Origin, Geoff Johns seemed to interpret Morrison's passionate, headstrong man of action as a guy who's just spoiling for a rumble. Johns' Superman slaps Batman and Green Lantern around as soon as he meets them and literally flies head first into bad guys. George Perez left the main Superman title after only six issues, citing conflicting direction from his superiors and a lack of information from Morrison as reasons for his departure. Scott Lobdell, who began writing the title with issue #13 initially seemed to grasp what Morrison was trying to do. For example, he had Clark Kent dramatically walk out of the Daily Planet to start his own blog that would focus on the injustices that a newspaper beholden to their advertisers and dwindling readership would be unable to cover. Sadly this plotline, like much of Lobdell's Superman run, went nowhere. 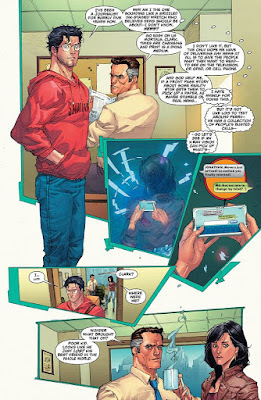 As for Action Comics, Morrison's successor, Andy Diggle was driven away from the book by behind the scenes tension after just one issue and his story was completed by the artist, Tony Daniel. 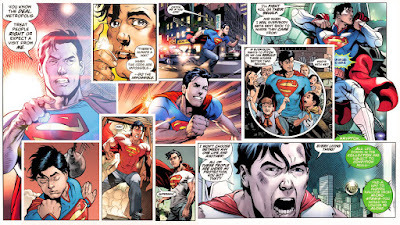 It wasn't all bad, New 52 Superman featured in some great stories during his time. These included Greg Pak and Aaron Kuder's Action Comics run, Charles Soule's run on Superman/Wonder Woman, a series by Scott Snyder and Jim Lee called Superman Unchained, and a great run in Superman by Geoff Johns and John Romita Jr. Overall however the quality was inconsistent and hardly any of them captured the spirit of Morrison's run. Pak and Kuder came the closest. Their Superman was significantly de-powered and once again clad in a t-shirt. They had him defending the people of his Metropolis neighbourhood from corrupt police officers, which made for some fantastic and iconic imagery. Unfortunately Pak and Kuder soon had to weave their stories into the larger arc running through the Superman titles, and so this status quo wasn't explored for very long. New 52 Superman was eventually killed off and replaced by his previous incarnation as part of DC's Rebirth relaunch. This old version of the character was now trapped in the New 52 Universe with Lois Lane, and together they were raising their son Jon. 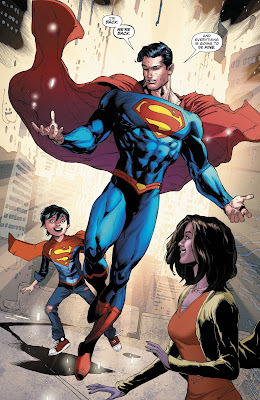 The quality of the books was suddenly a lot more consistent, and while Superman was far more mature and level-headed than the version Morrison gave us, his characterisation was also a lot more consistent. This week New 52 Superman returned from the dead long enough to merge with his counterpart. But the fact that he remains married to Lois, and is still the father of Jon is an indicator of which version is the dominant persona. It could be argued then that Morrison provided us with the perfect Superman for our times but DC mishandled the character to such a degree that they were forced to take a creative step backwards. However, it's also possible to argue that Morrison's Superman wasn't the hero we need right now. 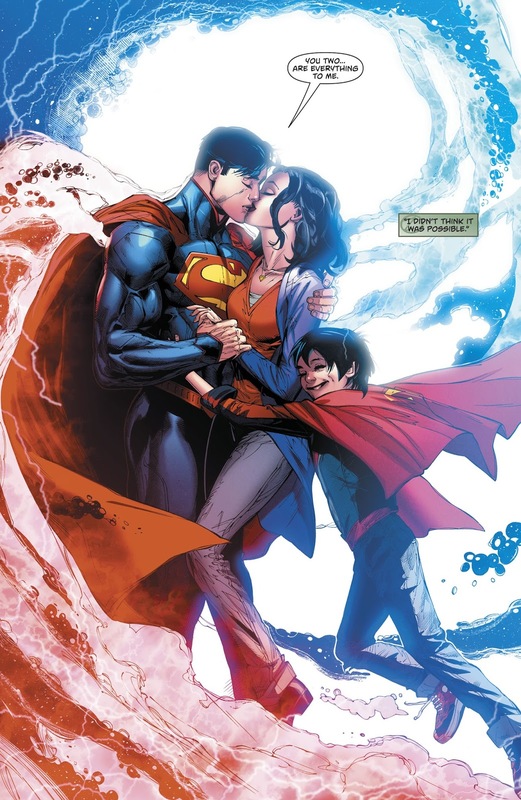 Perhaps the perfect heroes for our time are in fact the new Rebirth Superman, his wife Lois Lane, and their son Jon Kent. Despite the many parallels, this is not the 1930s. People all over the world are unwilling to stay silent in the face of injustice. We're living in an age of protest. That's not to say that the people of the 1930s remained silent in the face of injustice. On the contrary, they fought and died against it. But thanks to the internet many of us are living in an age of personal empowerment where we can share our fears, voice our frustration, and organise demonstrations of our discontent. We don't necessarily need Superman to punch injustice in the face for us. What Superman can give us instead is hope for the future, and hope that we actually can make a difference. In the world of Rebirth this hope is embodied in the son of Superman and Lois Lane, Jon Kent. Jon is Rebirth's contribution to the Superman myth. He's what has prevented Rebirth from being a step backwards for Superman, and he's what has kept Rebirth Superman relevant. I'm by no means arguing that Superman comics can save the world, or any such nonsense. But I am arguing that Superman comics can still be as reflective of the world in which they're produced as they were in the 1930s. A few years ago it seemed like we were reflected in an angry young man in jeans and a t-shirt. While Grant Morrison's Action Comics run remains an amazing Superman story in it's own right, perhaps now we are more accurately reflected by a man, a woman, and their Super-Son, looking towards the future.